The woman was hospitalized with serious injuries but is expected to recover, according to troopers. LEXINGTON, S.C. — A pedestrian hit by a vehicle in Lexington Monday morning has suffered serious injuries, according to troopers with S.C. Highway Patrol. 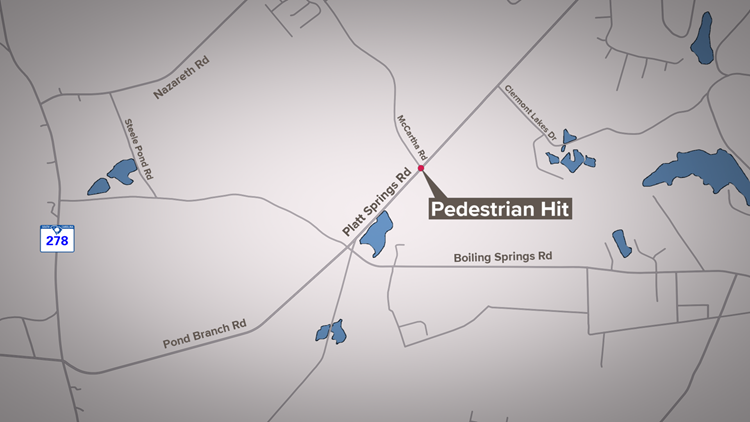 The incident happened around 5 a.m. Monday morning when a woman walking along Platt Springs Road near McCatha Road was struck by a vehicle, according to Lance Cpl. David Jones with S.C. Highway Patrol. The driver of that vehicle then fled the scene, according to Jones. The woman was hospitalized with serious injuries but is expected to recover, troopers say. Just before 11 a.m. Monday, troopers announced that Platt Springs Road had reopened. The road had been closed for several hours while troopers investigated the crash.